Sorry for the lack of posts...I've been MIA since July 5th! I got a bit busy and my camera has been on the fritz, but here I am! My neon obsession continues. I said it before, and I'll say it again, my China Glaze Summer Neons were my BEST purchase. Splish, Splash, I'm With the Lifeguard, Sun Kissed, and Hang Ten Toes are my current favorites in my collection. Ever since I purchased them, every manicure has had used at least one or more of the polishes, and this is no exception. 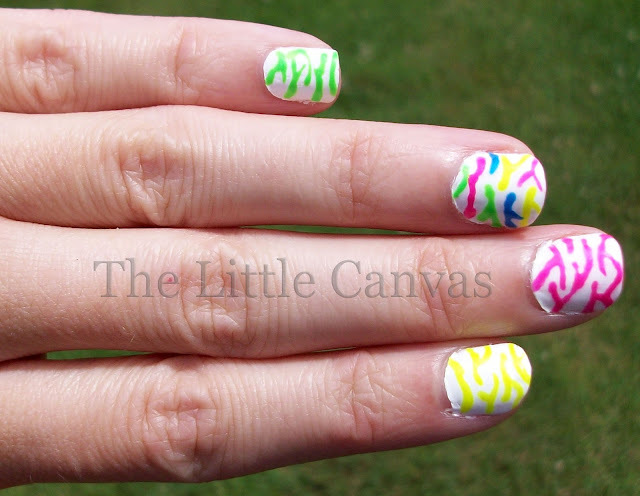 Neons and animal prints always seem to go, so why not do a zebra print? 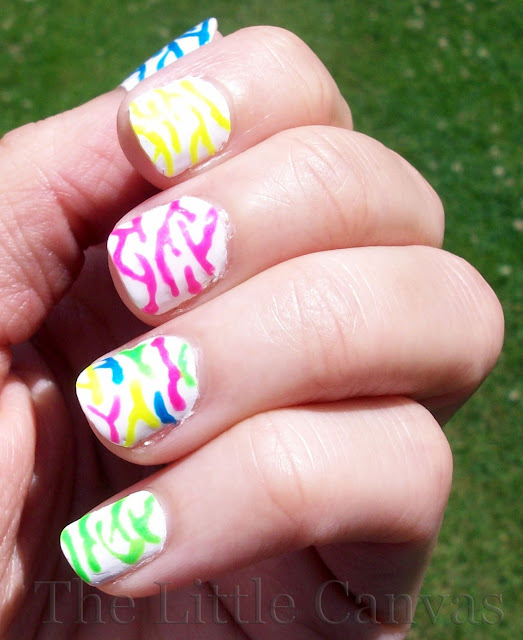 When coming up with this manicure, I wasn't sure if I should do neon nails with a black stripe or white nails with colored stripes. As I sit here writing this post, for the life of me I cannot remember who it was who said doing white base with colored stripes would look like the Zebra from Fruit Stripes Gum. Do you remember Fruit Stripes??? Ahhhh childhood memories...how I loved this gum. I remember though the temporary tattoos rarely worked, mainly because they were on the cheap gum wrapper. Either way, this stuff was addicting. For the manicure, I started with a base coat of white polish. With a tooth pick, I drew on the individual lines in the different colors. If you want to know how, you can take a look at my Tiger Tutorial which explains how you can add these lines without a stamper. To be honest, I never knew stamps existed until I started blogging. I figured everyone drew lines on lol. Have you ever drew on your own animal prints? Leopard, zebra, giraffe?? 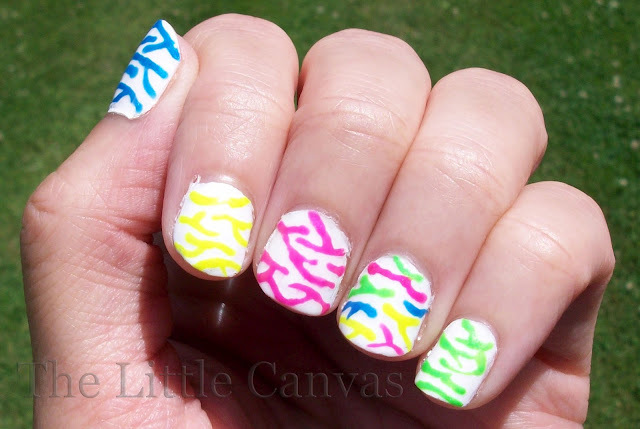 Do you find stamping easier? Are you as addicted to neons as myself? 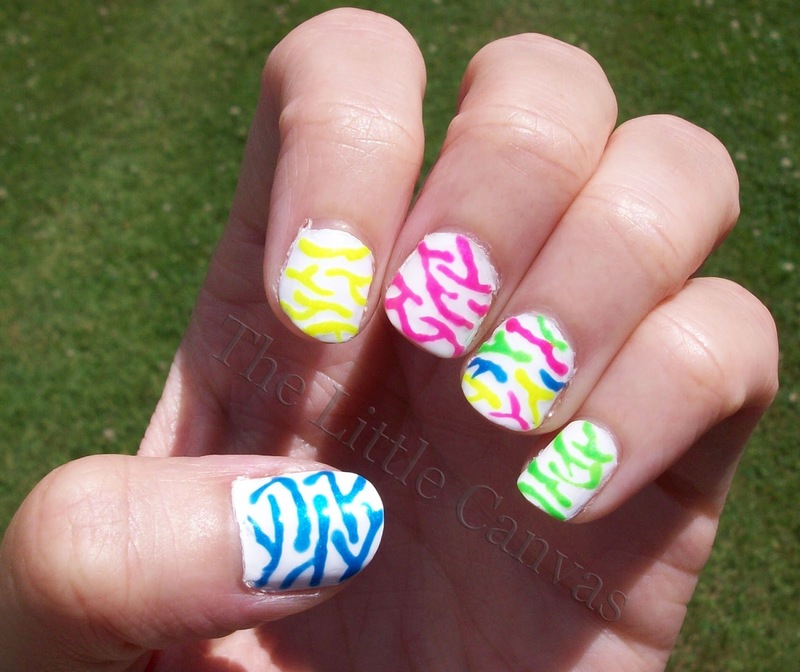 Until my next neon filled manicure, I hope you all have a good day!!! This is so cute!! I've never drawn animal prints. Or stamped them. Yours came out great! thank you!!!! you should try it! it's not as hard as it seems! I did once cheetah prints on a friend's nails, but I haven't done animal prints without plates on my own. I don't trust my left hand yet. you're so right!!! it definitely does!!!!! now these are more summery in my opinion! 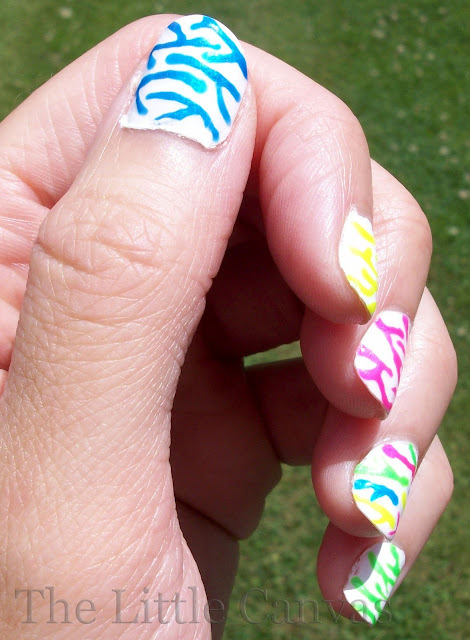 haha beach nails!!! lol I actually am doing a beach mani in a few weeks and will def be using that coral for reference! thank you so much!